Arrival of great deal with 300 ml! ○Coagulates fine particles drifting in the water which are a cause of cloudiness, and cleans the water by filtration. 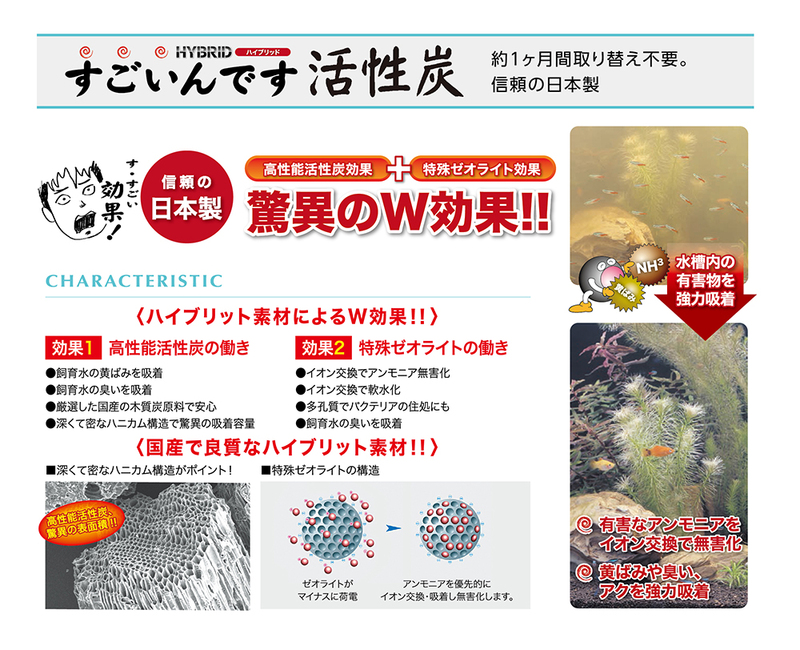 ○Also has the effect of removing floating algae, etc. ○Breaks down and removes harmful ammonia and nitrous acid, and quickly stabilizes the water quality. ○Breaks down and removes organic matter (residual food, excreta, dead grass, etc.) that settles on the bottom. ○ Breaks down and removes organic matter (residual food, excreta, dead grass, etc.) that settles on the bottom. Good bacteria break down dirt! ○Enzymes produced by good bacteria such as lactic acid found in yogurt are highly active even in the water! Fight off bad bacteria that damage water quality! Suppress water oxidation and realize the ideal underwater environment! ○Fossilized shell that has been used in agriculture and fish breeding etc. since ancient times! Highly concentrated natural minerals! Contributes to the sound development of fishes’bodies, cleans water with the absorbing power of fossilized shells. · Cloudiness · oil film removal. ·Suppresses the occurrence of moss. · Stable pH in neutral range. · Does not damage the pump with ultra fine particles. ○Great deal with concentrated type! 1500 L of breeding water can be treated with 1 bottle! ○Instantly remove chlorine contained in tap water, which is harmful to fish. · Supplies good quality minerals. · Contains mucosal protective ingredients of seaweed extract. · Creates an environment suitable for spawning. · Promotion of decomposition of food leftovers and feces. · Suppresses the smell and rot (oxidation) of breeding water. · Ideal for breeding without using a filter. · Maintains the health of turtles from inside the body.